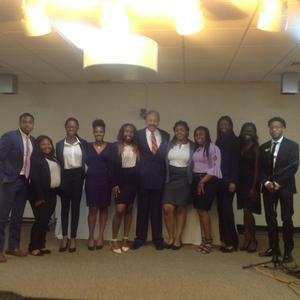 HU President Dr. William R. Harvey takes a photo with ten of the Leadership Summit Future Leaders who received early admission. HAMPTON, Va. (July 29, 2018) - Hampton University hosted the 21st Annual William R. Harvey Leadership Institute High School Leadership Summit from July 8 – 14, 2018. This year’s theme was 21st Century Leaders: The Millennial Generation, specifically designed to help rising high school juniors and seniors focus on “The Leader Within,” while gaining knowledge about Dr. William R. Harvey’s Ten Step Leadership Model. This residential program provided students with opportunities to establish a plan for after graduation through several challenging, but beneficial programs throughout the summit. This year’s summit hosted sixty-three rising high school juniors and seniors from various states across the country. The participants were introduced to a team of professional front-runners who shared their leadership styles and professional experiences, representing diverse professional backgrounds. Some of the presenters included, award-winning reporter, Mr. Don Roberts; Mrs. Jamesa C. Moone Hunter who works for the Executive Office of The President, Office of the United States Trade Representative; Ambassador James R. Bullington, who served in Burundi, and United States Congressman, Honorable Robert C. “Bobby” Scott. “When I attended the summit last year, I had an amazing experience with the other students and counselors. After attending the summit, I set a goal for myself to attend Hampton University and to become a camp counselor the following year,” said Jala Tucker, WRHLI Leadership Fellow and rising sophomore at Hampton University. “I soon realized the power of speaking your vision into existence. As a counselor, I wanted to make an impact on the students and help them understand their value and worth as young gifted minds. I really enjoyed giving back to these students and to the Leadership Institute which helped shape me into the leader I am today."